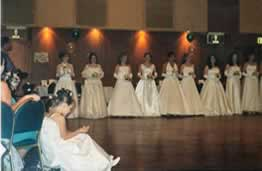 Every two years the NSW AIDA hosts a Debutante Ball. It is a fundraiser and any profits are held by the NSW AIDA to help with venue hiring and enables NSW to have that extra bit of revenue for things like overseas adjudicators at our State Championships. 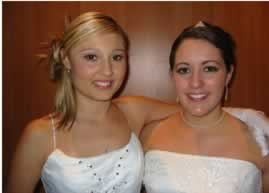 The idea of a Debutante is definitely old fashioned, but heaps of fun for the Deb herself. Years ago girls were not considered young ladies until they were 'out' socially. This meant they were eligible for marriage. The idea of being 'out' meant you wore your hair up and your hem down to the floor. You could go to dances, parties and balls and could be courted by eligible young men. The first season of being 'out' was your debutante year (it didn't take too many unsuccessful seasons to then go on to being an 'old maid'). In that first season if you were of the highest social order you were presented at court to the Queen or King and then attended your first ball. Most other young socialites were presented to leading churchmen or dignitaries. Now it is just an acknowledgement that your little girl is now a young lady and ready to meet the world. When is the AIDA ball held? In early May in even numbered years. Any suitable ballroom in Sydney. You must be at least 15 years old, (possibly older) and have some connection with the Irish Dancing community. Tell your teacher you are interested. Find a young male partner. Preferably not a boyfriend as there might be a parting of the ways just before the ball. Brothers, cousins and male class mates make great partners. Make sure they understand what they are in for. Make sure it is clear who is paying for what. Make sure they can attend the practices. The ball is not just a dinner dance. Each Deb and her partner must learn some formal dances like the Pride of Erin. And how to curtsey in high heels. They are held on Sunday nights in April leading up to the ball. 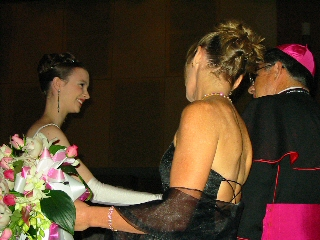 The guests assemble at the dinner tables and then each Deb is escorted into the room by her partner and swishes her way down the room and is presented to Bishop Cremin and the Matron of Honour for the evening, last time this was Ms Donna Halloran and the time before that it was Ms Charmaine May. After the presentation the Debs wait to the side of the ballroom till all the presentations are finished. 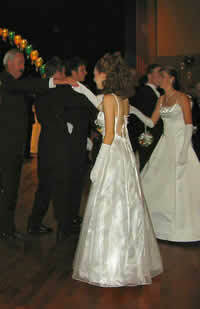 Then the dancing commences and the debs and their partners display the fine results of all their practicing. 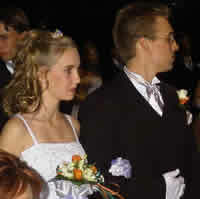 The young ladies then dance with their father or older male in their lives and their mother is escorted by their partner. Entertainment is then provided by younger Irish Dancers from all schools in the Sydney area. That completes the formalities and dinner is served. The Debs and their partners have their own tables. A live band is then in charge of the dancing and festivities and it can be a long night. A last, free dancing lessons! The practices will not cost you and turning a 16 year old boy into a ballroom dancer in six weeks .. it is a bargain. However you will have to pay for a white ball gown. You can hire but it usually is not a cheap option. You will have to pay for a bouquet for the deb and a buttonhole for the partner. The bouquet is in the colours of Ireland and all are identical. You need white evening gloves and probably new shoes. You might like to buy some of the formal photographs as well. But that is a few weeks after the event. Can I find a preloved dress? Anyone wishing to sell or buy a deb dress is welcome to contact me with full details and I will put up images.